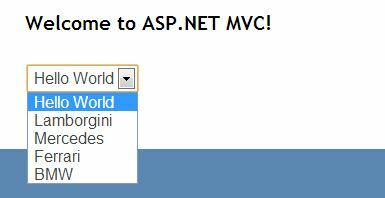 Html.DropDownList renders a dropdown list. It basically generates select element with options. This overload accepts name, which is set as id and name attribute. The above syntax shows, the overload accepting only name. This is not enough. 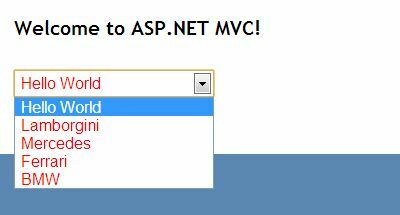 In MVC3, this overload would accept ViewData of type list passed from the controller. In case of o ViewData, the page will crash while rendering this control. The ViewData with same key which is specified as name parameter is declared in the controller. This ViewData is then use to populate the DropDownlist. This overload accepts one parameter more than previous one. It accepts optionLabel, which is set as selected option of the list. We need to pass ViewData with the key same as name parameter. The optionLabel parameter is set as first option of Dropdown. This overload accepts name and IEnumerable list of SelectListItem. We have created a List of SelectedListItem and assigned to the above overload. This overload also accepts htmlAttributes object. This overload accepts IDictionary object of htmlAttributes. I see HOW you populate the list - but where does it reside (in controller)? The list creation code resides inside Action method which renders the view. Then you can pass this list to View using ViewModel or using ViewData.